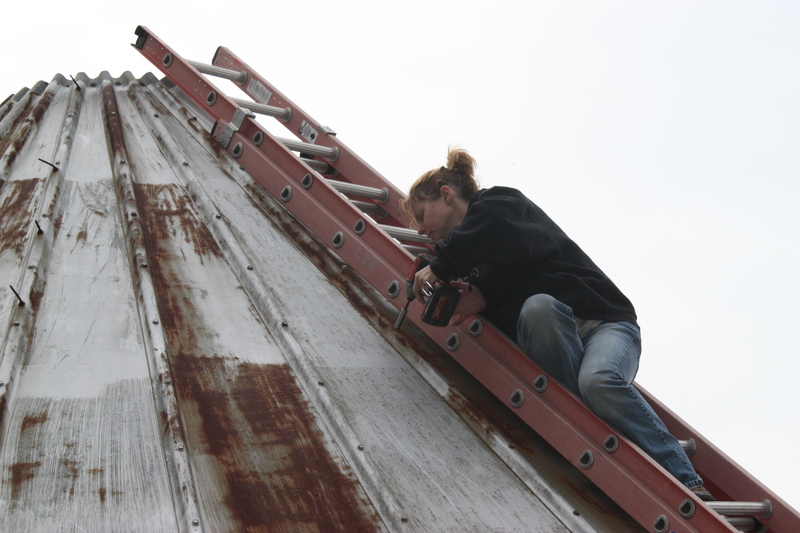 Conquering my fear of heights…one bolt at a time. I spent a good portion of my childhood climbing, sitting, playing & making forts in trees. My favorite tree, a Red Maple located in the corner of my mom’s yard, has since had its bottom branches trimmed off but there was one branch that doubled as a trapeze bar. We would hang upside down on it and it was our main access to the top. As I grew older, I could often be found out in the woods building forts on, under & on top of old fallen trees. In college I lived with many athletes since my dorm was located just next to all of our sports complexes. At the beginning of my sophomore year, the day after Labor Day to be exact, I was ‘recruited’ to try out the university’s circus. Let me clarify…I wasn’t trying out for it, I was trying it out. I hung on the trapeze, acted like an acrobat on the mats and then was asked if I’d like to try the high wire. I was very uneasy about doing it but gave it a try. The first time I didn’t get very far, got back up & tried it again. The second time I again fell, the fall was simultaneously followed by cracking and then a trip to the hospital. I broke my foot in 4 places. With that said I think I have reason to be scared of heights. For years I’d have nightmares about it and missed out on a lot of things. In more recent years I’ve attempted to work towards overcoming my fear. I’ve successfully sat in my tree stand – granted they lowered it 5 feet for me. I’ve taken my kids to the ‘big’ slide which is HUGE. 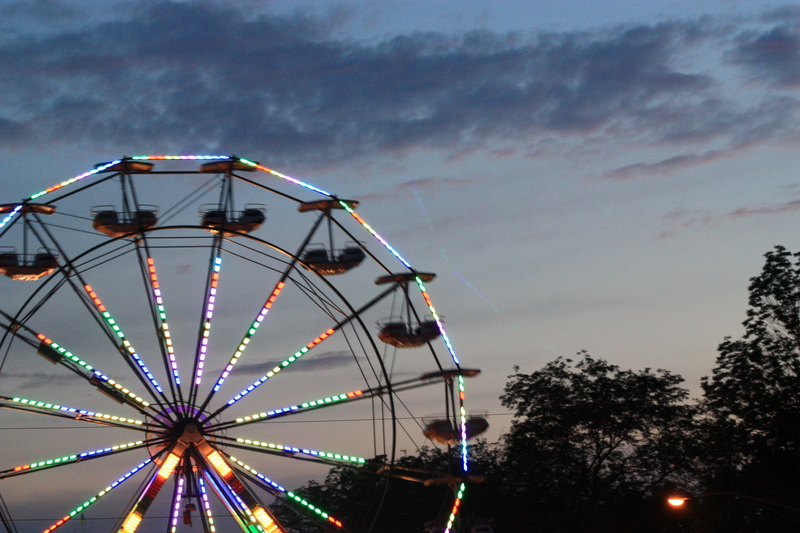 I’ve even gone on the farris wheel, once. It was during this past Labor Day weekend that I made the most progress yet. We are beginning to prepare for the winter and added a new shed to our operation to store supplies. It’s just like our first shed…which is still unpainted. Getting it built is like similar to a puzzle. You have to put each piece in just right before you can tighten all of the bolts. And, it’s a two-man job. With my hubby’s ‘main man’ – my brother-in-law at home with a newborn, I had to be the wingman. I wasn’t sure which would be worse. 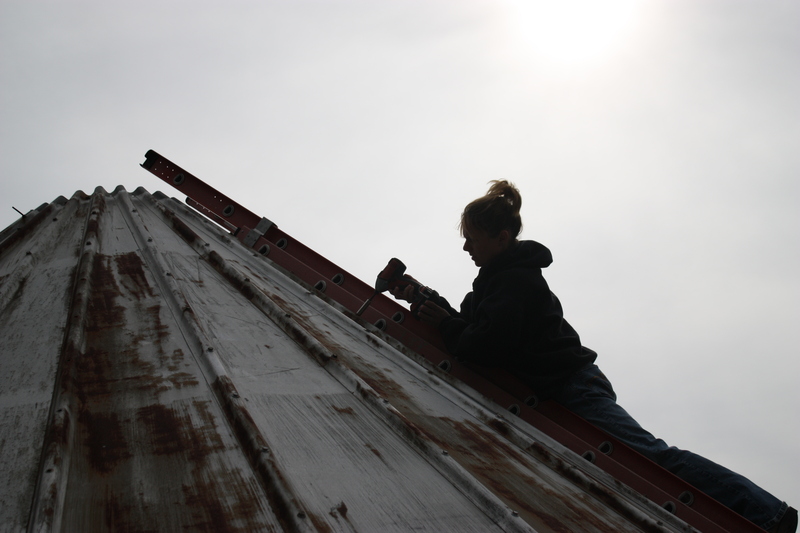 Being on the top of the roof or standing on top of a ladder, holding the bolts while they are drilled in from the other side. GULP, I choose the drilling job from the roof. 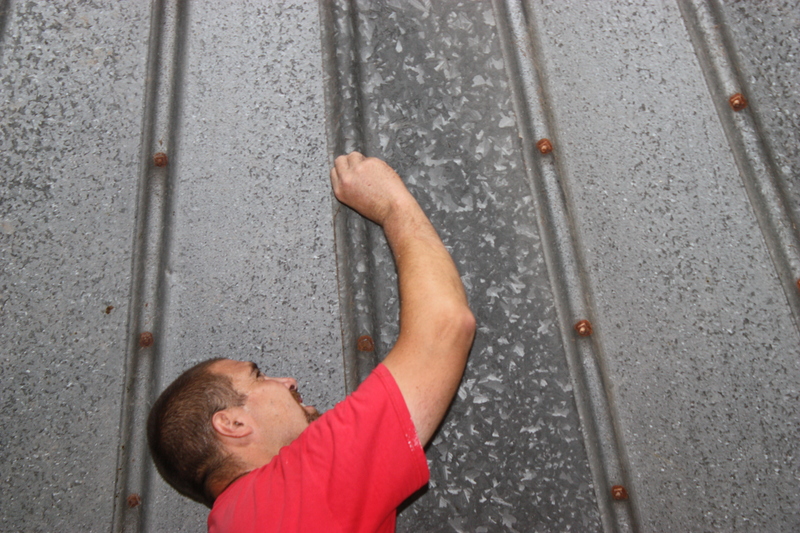 My Profile...one of many bolts I drilled that day. 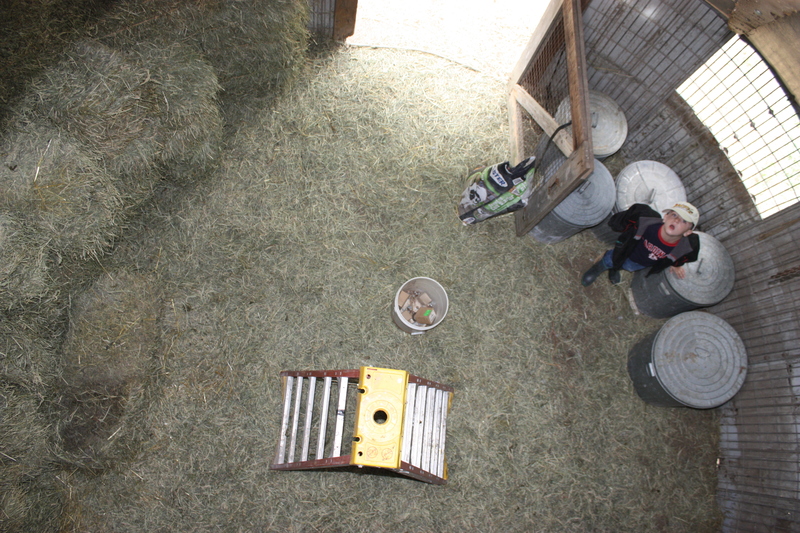 I’m proud to say that I completed the job & we now have a completed shed where we have started storing our hay and feed. And, I did it! Me, Moi! Now we just have to keep one pesky little hen out of it so she stops laying her eggs in there. Another project for this weekend…installing a new door. Tomorrow Willis & I head to our first Fishing Derby of the year. Last year he walked away with a trophy for the largest fish caught. He’s chomping at the bit for a second win. I’ll keep you updated! This entry was posted on September 18, 2010 by themagicfarmhouse. It was filed under The Barnyard and was tagged with barns, bolts, buidling, chickens, farm, Farming, fear of heights, sheds.